"Culture as a Driving Force of Korea's Progress"
Ambassador Chul Huh arrived in Chicago in March 2010. Before he was appointed as the Consul General of the Republic of Korea in Chicago, he served as Director-General & Ambassador for Korea Peninsula Peace Regime for two years. He has served as Director of North America Division III as well as Director of Consular Division. He was also Advisor to Minister of Foreign Affairs and Trade in 2003 and Principal Secretary to the Minister of Foreign Affairs in 1997. 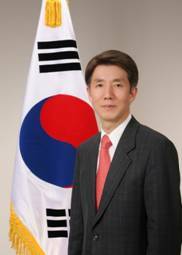 Ambassador Huh served twice as Assistant Secretary to the President for Foreign Affairs, in 1996 under then-President Kim Young-sam and in 1998 under then-President Kim Dae-jung. His overseas missions included posts such as the United Arab Emirates, the United Nations, India, the United States of America, and the Kingdom of Belgium and the European Union. After working at a petroleum company for two years, he left and joined the Ministry of Foreign Affairs in 1981. Ambassador Huh graduated from Yonsei University with a B.A. in Economics and received his M.A.L.D. from the Fletcher School of Law and Diplomacy.